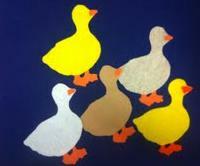 This week I put together a simple, but very appealing feltboard for Five Little Ducks. Their feet are actually all one piece, glued to the back - I think it really works. and all five ducks came waddling back.